Proposition 66 was sold to voters as a surefire way to speed up the state's decades-long death penalty appeals process, but its ability to do that was cast into doubt Thursday after the California Supreme Court ruled that a five-year deadline imposed by the initiative is "directive, not mandatory." In other words, it's a goal, not a hard deadline. 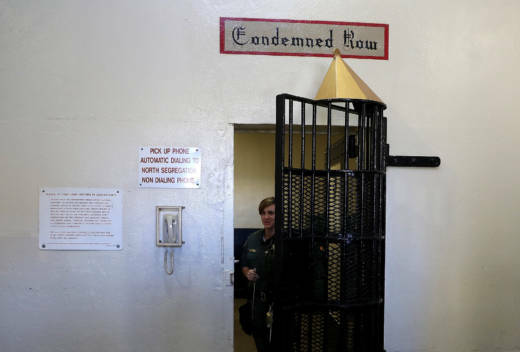 Still, the decision could clear the way for executions to resume in California, where no one has been put to death in over a decade and 18 of the more than 750 death row inmates already have exhausted their appeals. The executions could resume because in its 5-2 decision, the court upheld most of the ballot measure, dismissing several of the arguments posed by opponents of the death penalty. But it upheld part of the challenge, writing that the five-year deadline on death penalty appeals in California is unrealistic and, if enforceable, would "pose serious separation of power problems." "Case law establishes that ... the constitutional separation of powers does not permit statutory restrictions that would materially impair fair adjudication or unduly restrict the courts’ ability to administer justice in an orderly fashion," stated the majority, written by Justice Carol Corrigan. She was joined by justices Kathryn Werdegar, Goodwin Liu, Leondra Kruger and Andrea Lynn Hoch. Hoch sat in on the case after Chief Justice Tani Cantil-Sakauye and Justice Ming W. Chin removed themselves because the lawsuit named the state's Judicial Council as a defendant. Both serve on the council, a policymaking body for the court system, which would have to make new rules to implement Proposition 66. Proposition 66 was narrowly approved by California voters last fall, who at the same time rejected a measure to abolish the death penalty. While voters were told the measure would limit court appeals to five years, they were not told how that would occur, according to the state Supreme Court ruling. The court leaves open the possibility that individual prisoners could challenge other parts of Proposition 66. But Kent Scheidegger of the Criminal Justice Legal Foundation said he's pleased most of the ballot measure was upheld. "The voters voted for a broad reform with many changes to the capital review process, and that’s what they’re getting," Scheidegger said. He said other parts of Proposition 66, including stricter limits on what can be appealed by death row inmates, will greatly reduce delays of executions. "We’ve cut back the third, fourth and fifth reviews inmates try to file by limiting them to claims of innocence," Scheidegger said. "That’s an extremely important reform. I can’t overstate that. They have really bogged down the process by burying the case in paper on issues that had nothing to do with the guilt or innocence of the crime." Justice Mariano-Florentino Cuéllar wrote a concurring and dissenting opinion arguing that the court should go further. Justice Raymond J. Ikola, who also sat in on the case because of the recusals, joined his opinion. "What reasonable voters would have clearly recognized ... is that Proposition 66 contained a genuine, enforceable, five-year deadline for completion of the state court appeal and resolution of the initial habeas corpus petition in death penalty cases. Candor requires us to be equally clear about whether such a deadline accords with our law: It does not," he wrote. Christina Von der Ahe Rayburn, who represented the plaintiffs in the case, said in a written statement that opponents of the ballot measure are gratified by the ruling even though it didn't go as far as they would like. University of California Law School Dean Erwin Chemerinsky, who filed an amicus brief opposing Proposition 66, said opponents of capital punishment may not be disappointed by the ruling. "There’s an enormous lag time between when somebody needs an attorney and when one is provided," Chemerinsky said. "That accounts for more of the delay than anything else. The problem with Prop. 66 is it doesn’t deal with that problem. You can’t magically say let’s have more lawyers qualified to handle death cases unless there’s some mechanism to provide them."